This is one of the oldest varieties of Nishikigoi. 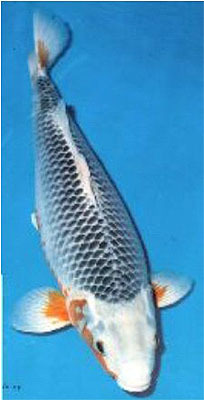 The Asagi provided the base for many subsequent varieties such as Kohaku, Koromo, Matsuba, Goshiki, Kujaku, Komunryu, etc. Asagi is covered in a blue/white net-like reticular pattern and its head should be light blue, clear and unblemished. The abdomen, pectoral fins and cheeks should be deep orange or red. There are two important types of Asagi: Konjo Asagi (which has dark-blue scales, almost black) and Narumi Asagi (medium-blue scales). - Mizu Asaki (or Akebi Asagi): light-blue/grayish scales (the lightest colour blue of Asagi). - Taki Asagi: have a white band between the blue back and the red abdomen. - Asagi Sanke: back is pale-blue, lower abdomen is white and the head and upper abdomen have red. - Hi Asagi: the red from the abdomen extends above the lateral line sometimes all the way to the dorsal fin. Asagi koi have red below the lateral line to the under side, often some red on all fins and the red can come up from the belly to cover the gill covers and to the base of the mouth. Blue color is above the lateral line. The blue color can vary from dark almost gray to a very light blue depending on the bloodlines. The lighter shade of blue of the Narumi bloodline is preferred. The blue color of each scale is surrounded by a lighter ring around the edge of the scale giving a netting appearance which is very pretty when all of the scales line up in straight rows. This last point is very important in judging Asagi. Also, it is difficult to have a clear head with no blemishes so this also is a strong judging point. Asagi were documented over 160 years ago and have evolved to the beautiful specimens we find today. The Asagi is fully scaled. Because the Asagi resembles the Magoi, some beginners do not feel it is a Nishikigoi. There are three types of Magoi--"Tetsu (Iron) Magoi", "Doro (Mud) Magoi," and "Asagi Magoi." The last one is said to be the ancestor of the present Asagi. Asagi Magoi have a blue back with a light blue or white reticular pattern crossing it. Some scales have a blurred appearance. Hi appears on both cheeks, sides, and pectoral fins. There are two basic types, the Konjo Asagi and the Narumi Asagi. The black colour of the former is dark blue, similar to that of the Magoi. Narumi Asagi have scales with a dark blue center, shading into light blue towards the edges. Konjo Asagi as well as Tetsu Magoi are used to produce blackish Nishikigoi such as the Aka Matsuba, the Ki Matsuba, and the Ki-goi. Narumi Asagi on the other hand, are used to produce whitish Nishikigoi such as Kohaku, the Taisho Sanshoku, the Shiro Bekko, the Goshiki, the Ai Goromo, the Budo Sanshoku, and the Shusui. Types include the Konjo and Narumi, plus the Asagi Sanshoku, also there are the Akedi or Mizu, and the Taki Asagi. As for the pattern, a spotless white or light blue head is desirable. Spots on the head quickly downgrade the koi's quality. Each blue scale on the back should be clearly seen. The contrasting white or light blue reticular pattern should be sharp and distinct. It is also a fundamental requirement that Hi appears on the cheeks, abdominal region, and fin joints. The colour of the Hi should be bright red. 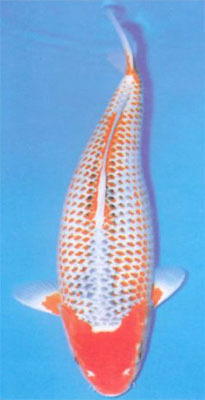 Red pectoral fins are called "Shusuibire"." Blue and red should be clearly divided. Brownish Hi degrades the koi. When the koi get older, their Hi tends to spread above the lateral line, which is usually undesirable. Black spots along the border of the Hi are disliked. The abdomen should be milky white. The "Akebi Asagi", sometimes called "Mizu Asagi", are light blue koi. "Taki Asagi," have a white band between the blue back and the red abdomen, "Asagi Sanshoku" have the characteristic Asagi blue back, but also have Hi markings on the head and sides and a milky white abdomen.